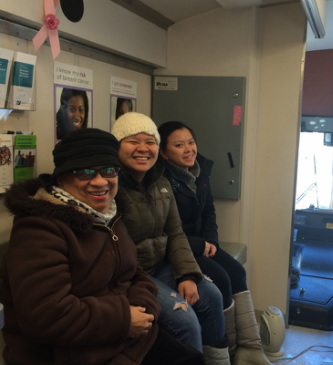 Q: How long has AICF’s Mobile No-Cost Breast Cancer Screening Program been serving women? AICF’s Mobile No-Cost Breast Cancer Screening Program has been serving women for over 30 years. Q: Do I have to be Italian to be screened with AICF? Absolutely not! AICF will provide a no-cost mammogram and clinical breast exam to any female New York City resident who meets our eligibility requirements: you must be 40-79 years old, a resident of one of the five boroughs, and you can't have had a mammogram within the last 12 months. Q: How much does it cost to get my mammogram on the van? It will not cost you anything! If you are uninsured, AICF pays the full cost of the exam. If you are insured, our pays the difference not picked up by your insurance and any co-pays you might have. Q: How long does the mammogram and clinical breast exam take? A mammogram takes approximately 20-30 minutes as does a clinical breast exam. Q: What happens if I get screened on the bus and there is something wrong with my mammogram? If you have an irregularity or require additional testing, our Patient Navigator will call you to let you know and direct you to one of our follow-up hospitals in your borough. If you do get directed to a follow-up hospital, it does not mean you have cancer. There are numerous reasons for needing additional testing and you should speak to your doctor. Q: I’m an undocumented immigrant and do not want to give any of my information to you. Can I still get a mammogram? You have a right to medical treatment regardless of your immigration status. The reason we ask for information such as name, address, age and telephone number is so that if you need follow-up care, we have a way to contact you. Q: Do you work with a licensed medical provider? Yes. AICF currently partners with Multi-Diagnostic Services, Inc on a contractual, fee-for-service basis. AICF requires that its provider be part of the New York State Cancer Services Program, a program of the New York State Department of Health that provides free breast cancer screening services to uninsured women. Q: How can I make a donation to the AICF's Mobile No-Cost Breast Cancer Screening Program? Please call Ruth Vega, Director of the program at 212-628-9090 if you would like to make a donation. Read more about donating here. Q: How do I get the Mammography Van to come to my organization? If you would like to host the bus, you need to fill out an application and should have at least 25 women who are interested in getting their annual mammogram on our Mammogram Bus. If you only have a few women interested in being screened, have them call 1-877-628-9090 to get an appointment in their area. Read more about hosting a screening here. Q: Why do you need appointment beforehand? Our program is appointment-based for several reasons. First, we want to minimize the waiting time for our patients and efficiently space out appointments throughout the day. We need to make sure there are enough women interested in getting screened on your screening day so that our vbus and staff’s services can benefit the most women. Q: If the program is “no-cost,” why do you charge my insurance company? AICF is a grant-funded program and our goal is to serve the most women possible with the limited funds that are generously allocated to our program. If your insurance covers part of the cost of the mammogram, less of our grant money is used per patient and we are therefore able to serve more women overall. Q: What is breast cancer? Breast cancer is a malignant tumor that starts in the cells of the breast. A malignant tumor is a group of cancer cells that can grow into (invade) surrounding tissues or spread (metastasize) to distant areas of the body. Q: Who gets breast cancer? The disease occurs almost entirely in women, but men can get it, too. About one of every eight American women will get breast cancer during the course of her lifetime. Still, the disease is more likely to strike certain women. Factors such as age, family history, reproductive and hormonal factors, not having children, obesity, lack of exercise and drinking alcohol are just a few risk factors that can increase the likelihood of breast cancer. For men, the lifetime risk of getting breast cancer is about 1 in 1,000. Many risk factors can increase your chance of developing breast cancer, but it is not yet known exactly how some of these risk factors cause cells to become cancerous. Hormones seem to play a role in many cases of breast cancer, but just how this happens is not fully understood. Q: What is a clinical breast exam? A clinical breast exam is done by your doctor or nurse in an office or clinic. He or she will look at and feel your breast and under your arms to look for abnormalities in size or shape, changes in the skin, or any lumps. Sometimes breast cancer can be felt, but not seen on a mammogram. Q: Is there anything I can do to decrease the chances that I might get Breast Cancer? Although we are still unsure as to the direct causes of Breast Cancer, there are a few things that may help reduce your risks. Eating a healthy diet, exercising regularly and having regular mammograms may help limit your risk. Q: What is a mammogram? A mammogram is an X-ray of the breast. It is the best screening tool we have today to detect breast cancer early when it is most treatable. It can help to find breast cancer when tumors are very small, even too small to feel. It can detect abnormal changes to the skin and calcifications. Mammography does a good job of finding cancer. However, it is most accurate when used with another screening test called a clinical breast exam. Q: Who should get a mammogram? According to the American Cancer Society’s guidelines, women should have a mammogram and clinical breast exam every year starting at the age of 40. Women in their 20s and 30s should have a clinical breast exam (CBE) as part of a periodic (regular) health exam by a health professional, at least every 3 years. After age 40, women should have a breast exam by a health professional every year. To get a good picture, the technologist needs to flatten the breast. You may feel some pressure, but it only lasts a few seconds. Let the technologist know if you feel any pain. Q: Is the radiation in mammography harmful? A woman is exposed to some radiation during a mammogram. While the radiation exposure during mammography can increase the risk of breast cancer, this increase in risk is very small. Studies show that the benefits of mammography outweigh the risks. Q: What happens if they find something on my mammogram? If something is seen on the mammogram, it doesn’t mean that you have breast cancer. You might have more x-ray pictures or other tests. Then your doctor can make the best plan for you. Q: How can I get a mammogram? Call our toll free number: 1-877-628-9090 to schedule an appointment at a location near you.